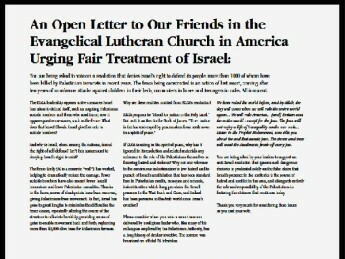 This ad, an open letter by CAMERA to ELCA members, urging fair treatment of Israel, appeared in the August 12, 2005 edition of USA Today . The magazine of the Evangelical Lutheran Church in America is spreading extreme misinformation among its members about Israel's security fence while the church is urging them to vote on anti-Israel resolutions. The AP contorts the English language to avoid correcting an incorrect statement that Palestinians with West Bank identity cards are banned from entering Jerusalem at all. In fact, such Palestinians regularly enter Jerusalem. A column in the Detroit News relied on numerous factual errors to support its call for economic divestment from Israel, yet the newspaper is avoiding its obligation to correct the factual errors in its pages. Though it is legitimate for the paper to publish such advocacy in the opinion pages, it is not acceptable that it allow the false information to pass uncorrected. After Israel approved building a new neighborhood in Ma'aleh Adumim, a few miles east of Jerusalem, many news reports wrongly indicated that such building would prevent Palestinians from controlling "contiguous territory" in the West Bank. Although opinion and editorial writers have more leeway than news correspondents, the Statement of Principles of the American Society of Newspaper Editors makes clear that they are not off the hook when it comes to the facts. Thus, while editorial writers are free to interpret the meaning of events, they are not supposed to misreport what has actually transpired. The Los Angeles Times did just that in a Feb. 22 editorial. CAMERA's letter highlights that according to numerous United Nations resolutions, Israel's security fence does not run through Palestinian territory, and the "Green Line" is not a border. Saree Makdisi, an English professor at UCLA, made falsified charges against Israel to bolster his case that the country is a racist, illegitimate state unworthy of existence. The Los Angeles Times' partial correction yesterday of distorted charges regarding the West Bank security barrier does not inform readers, but further misleads them.